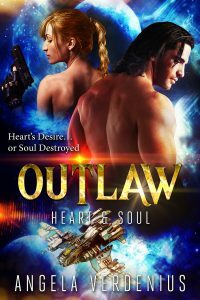 He’s never believed in keeping slaves, in buying and owning another person, but a soft-heart and an unexpected attraction has made Darvk, the Daamen captain of a trading crew, break his belief, and he’s now the new owner of a notorious outlaw. She’s beautiful and feisty, she’s injured, and she has blood on her hands. One of an outlawed race of warrior woman, this Reeka is intent on escape. Escape for her could mean capture and death, and he can’t let that happen. The bounty hunters are on her trail. But so is the Inka Empire. Tenia’s hell-bent on finding her sister – both blood kin and warriors, but escaping the Daamen captain isn’t as easy as it looks. He says he’ll help her. Can she trust him…and her heart? From the Outlaw Sector to the Lawful Sector, nothing is as it seems, there are allies and enemies in a vast universe…and a secret that loops back to the very bloodline of the Reekas.